Chick Lit Central: Erik Atwell "flies" to Venus and has a book to give away! Erik Atwell "flies" to Venus and has a book to give away! A couple of weeks ago, we got a "dude's" perspective on chick lit. Now we have another "dude" at CLC to tell us how he gets inside the mind of a woman! 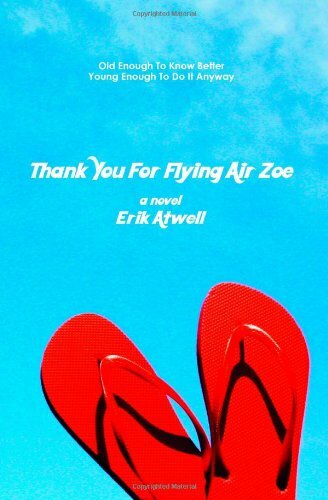 Meet Erik Atwell and his novel, "Thank You for Flying Air Zoe." A few months ago, Erik was doing a giveaway of "Thank You for Flying Air Zoe" at Goodreads and Melissa A. asked him how he gets into the mind of a woman. She was so fascinated by his answer that she asked him to elaborate right here at our blog. And that he did! He's also giving away one copy of his book right here to a lucky reader anywhere in the world! Erik Atwell started his writing career in grammar school, when a one page history class assignment ballooned into a forty page fictional account of a politically controversial silversmith in Boston circa 1776. From there, he wrote short stories while living in New Hampshire, screenplays upon moving to Los Angeles, then finally novels when he ultimately landed in Seattle. He now lives in Seattle with his rock star wife and his four-month-old son, whose only musical claim to fame thus far is sleeping through an entire Go-Go's concert. But in his defense, he was three weeks old, and the stage was a quarter-mile away. "Thank You For Flying Air Zoe" is his first novel, and he hopes to write a second novel before the little guy treks off to college. You can find Erik at Facebook, Twitter and his blog. Back in college, my first fiction profs taught us fledgling Pulitzer winners that the best writing stems from our own experiences. This is why twenty years later, I wrote a novel about a woman who was once a drummer in an all-girl garage band. As you can probably guess, I was a so-so student. Kidding aside, I very much believe that empirical knowledge of a subject allows writers to more directly connect with their material, which ultimately helps them draw in their readers. So this begs the question... If men are from Mars and women are from Venus, what exactly is a Martian like me doing writing a novel with a distinctly Venusian spirit? Here’s a well kept secret among authors. Men have actually been writing chick lit long before the genre even existed. Take, for instance, Nathaniel Hawthorne’s 1850 novel about a woman with a penchant for monogrammed fashion, "The Scarlet Letter." So really, I’m just following legendary literary footsteps. See, I’ve inexplicably been writing stories with female protagonists since those ambitious college years. And after years of being heartbroken and tossed aside by my many leading ladies, my novel "Thank You For Flying Air Zoe" recently had the fortune of being published. I often get asked how I go about getting inside the mind of my female characters. Sometimes I casually joke that any success I have depicting women in my writing is solely due to an extensive study of romantic comedies that dates as far back as the Meg Ryan era. So too do I often cite a more simple explanation – women are awesome, and I’ve spent a great amount of time paying attention to them. Some of my best friends are women. Some of my best enemies are, too, but that’s irrelevant, right? Still, none of this speaks to the heart of how I as an author try to access the mind, body, and soul of a female narrator. And I guess the only way I can explain it is this. I think that actively trying to write from a female perspective would be inauthentic, and it would cheapen both the character and her story. The voice would come across as too manufactured and too forced. Yes, my fictional superstars are eighties’ ladies to their Aquanet and Jordache core, but their hopes, fears, and grand life philosophies are timeless and universal. "Thank You For Flying Air Zoe" may be a story about a group of forty-something women seeking to reunite their band. But at its heart, it is also an homage to anyone looking to recapture the dreams of their youth, or reignite a spark in their lives that may have flickered out. Over the course of my lifetime, the gap between male and female archetypes in both literature, as well as society itself, have lessened dramatically. As a writer, I aspire to tell a story that’s accessible to a reader regardless of their gender. Thus far, "Thank You For Flying Air Zoe" seems to be connecting with readers who typically don’t even dip their toes into the waters of chick lit or women’s fiction. Yup. Martians. "Air Zoe" has actually won a few of them over – who knew! This thrills me to no end. However, the ultimate thrill is when I hear a woman say that they enjoyed the story. This tells me that I’ve done what I set out to accomplish, which was to do both a genre and a gender their due justice. Trust me, when my novel was first released, I was terrified that I’d be crucified by readers. Sure, my wife had assured me that I’d written a thoughtful and entertaining story, but she’s pretty much required to say that by marital law, no? Like most authors, I secretly craved third-party validation, particularly from female readers, who are the very engine that keeps the chick lit machine churning in an age when many highbrow lit critics seem super eager to pull the trigger on the genre. But this is another hot-button topic for another time, isn’t it? If I was in fact lucky enough to succeed at gracefully and accurately write a female main character, it was not because I was able to crawl inside the mind of a woman and understand their innermost thoughts. It was because I saw her as no different from me – apart from body parts and chromosome patterns, of course. With "Air Zoe," I subversively stayed in my comfort zone. I wrote what I knew internally, not externally. Without a doubt, I would have a difficult time writing within this genre if my heroine was in the final trimester of a pregnancy, or going through any sort of intensely personal and gender specific experience. But could I write a chick lit novel if my heroine got all nostalgic over the 1980s and wanted to reunite her teenage garage band? Oh yeah, this I could do. We are thankful to Erik for sharing what's on our minds and for giving away a copy of his book to one of our readers. 1. Please tell us: Who is your favorite singer or band from the 80's? Giveaway ends November 28th at midnight EST. I really like Tears for Fears. I was a huge Duran Duran fan! Oh boy, I have SO many. I'm an 80s child. Let's see...Chicago, Bon Jovi (I like their old stuff so much better), Def Leppard "Pour Some Sugar On Me" and the Bangles! Yup. This could be fun. Thank you all for reading & playing along! Bon Jovi would be my favorite. The eighties were all about Bruce Springsteen for me. Happy Thanksgiving & thanks again! I love most of the 80s pop music so I don't have a favorite but when I was a baby, I was fond of Whitney Houston. Also, I've asked to join the facebook group under my name : Anjana Vasan. My favorite singer from the 80's is Madonna. I was a madonna fan, a big Roxette fan and Bryan Adams and Bon Jovi all the way! I just discovered this blog and am now a follower! I follow this blog via twitter, does that count?? I have a few favs! The Cure, Bauhaus & Haysi Fantayzee are among the favs! Oops. Forgot to mention...followed the blog and tweeted the contest! Where to start... Adam and the Ants started out the 80's for me, I finished off the 80's with the guilty pleasure of Guns & Roses! I am a Twitter & FB follower, too! Great giveaway!! Thanks for the giveaway. My favorite band from 80's is Bon Jovi. Hands down, no contest! The best concert I have ever been too! The others named some other groups that I love too, like Air Supply, Poison, Chicago, etc. etc. They sure don't make 'em like they used to!